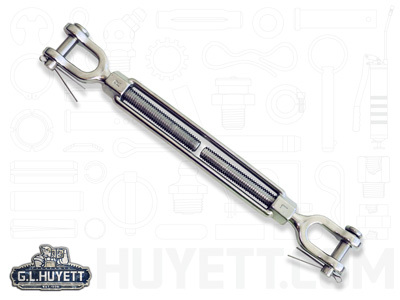 Turnbuckles are not intended for lifting as they are designed to take up slack and apply tension for support or suspension, or to adjust the length of rope, cable, or tie rods. They consist of a metal frame called a body that is tapped with a left-hand thread on one end, and a right-hand thread on the other. Two end fittings (studs, eyes, hooks, or jaws or a combination of any two of these) are screwed into either end and attached to workpieces on either end before the body is rotated (turned) and both end fittings are drawn into the body simultaneously to apply tension. U.S. Federal Specification FF-T-791B provides specifications for eight classes of turnbuckle components including untapped bodies, tapped bodies, stub/stub, eye/eye, hook/hook, jaw/jaw, eye/hook, and eye/jaw. Choose from galvanized steel, die-cast, or corrosion resistant stainless steel.